While on a game drive in northern Botswana, a married couple witnessed a dramatic scene involving a troop of baboons fleeing from a pack of lions. What they saw next was completely unexpected — and showed the surprising tenderness that can be exhibited by even the most ferocious of animals. All photos courtesy Evan Schiller. They are republished here with permission. In November 2012, while on a 16-day photographic safari trip in Botswana, photographer Evan Schiller and Lisa Holzwarth spent four days near the banks of the eastern Selinda Spillway in the 320,000 acre Selinda Reserve of northern Botswana. With their guide, Isaac Seredile, they were witness to an extraordinary sequence of events — and they were kind enough to share their experience with me via email. While out on safari, and after observing some hyenas and a leopard, the trio suddenly heard a commotion. "There was a troop of 30-40 baboons heading in our general direction making a lot of noise," they wrote. "The baboons settled on another 'island' of trees a safe distance from the leopard. Isaac quickly drove us to the troop and said again, keep your eyes open, they are sounding the predator alarm." Just as he said this, two lionesses came out of the tall grass and rushed the baboons in the trees, only to be joined by two more lionesses. "Between the baboons shrieking and the lionesses communicating with deep guttural roars, it was a mad scene," they wrote. "The baboons were safe in the trees but anxious about the lions clawing on the trunks." With all the bedlam, they suspected someone was going to lose their cool and make a run for it — and that's exactly what happened. Three baboons were focused on another set of trees a few hundred yards away. Two made it, but a third was grabbed by a lion as she tried to scale the tree. And that's when they saw the baby. "As the third baboon lay dying on the ground, we noticed a little baby — less than a month old — slowly disengaging from its mother's dying body," they said. "Despite its young age, I was amazed to see how instinct so quickly kicked in that it immediately tried to find safety in a tree. Unfortunately it did not know how to do this quickly or quietly. While its instinct was good, it hadn't yet mastered speed or agility." It was at this point that the lionesses noticed the little one. "They were intrigued, but did not go for the 'kill' which would have taken less than a nano-second if they had been so inclined. 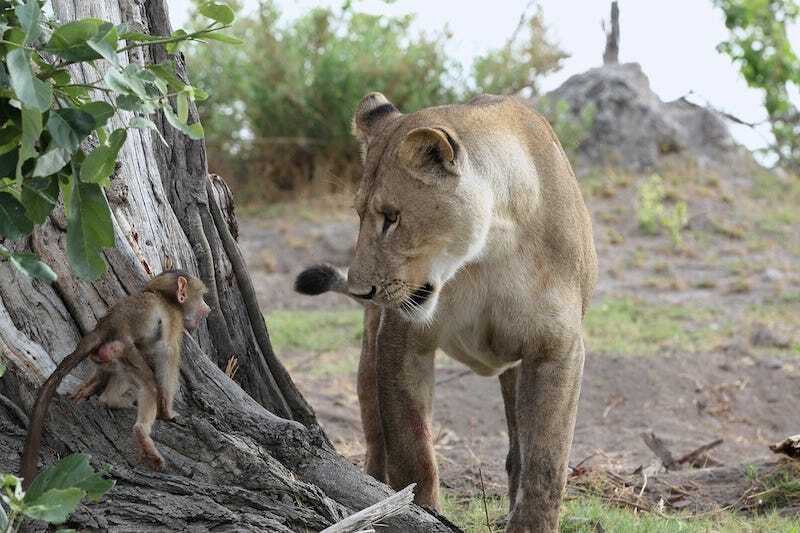 The baby and one of the lionesses engaged in the African version of a big cat-and-mouse game which we have watched countless numbers of times with our own domestic cats and their catches of mice, moles and chipmunks." Even and Lisa said the baby was jumping up and down, screaming and hitting the lioness on her nose. She continued to gently knock the baby off the base of the tree each time it seemed to make a little bit of progress in its vertical attempt at escape. "The lioness then carried the baby in its mouth (really at that moment she could have swallowed it whole without a blink of an eye) and put it down on the ground in front of her," they wrote. "What happened next blew our minds — the baby, in another instinctual moment, held onto the lioness' chest and tried to suckle. Evan's pictures say it all. All the while, the Baboon leader was climbing up and down his tree, calling loudly and making whatever noise he could to distract the lionesses." "The lioness was being as gentle as a 350 pound cat can be with a 3 or 4 pound baby baboon," they said. But the baby was now showing signs of physical harm and fatigue from the whole ordeal. "After allowing the baby to 'suckle' for a bit, the lioness again picked the baby up in her mouth — I was in agony watching the baby's ordeal — and kept on turning off the video option on my camera because it was hard to record." Suddenly, two male lions approached. It's not clear if they were curious about the baby, though Evan and Lisa suspect they were interested in "checking-out" the ladies. The lionesses made it clear they weren't interested. With the lionesses busy trying to ward off the amorous advances of the lions, a big male baboon, who had been trying to no avail to rescue the baby, was now able to climb down the tree, grab the baby and then head back up to safety. Unfortunately, he chose a dead tree and he soon felt the heat of the sun. "I was touched by how gently the Father Baboon held this little baby who was in tough shape after its ordeal," they wrote. "The baby's body appeared limp and we thought it had succumbed. Isaac told us that if that was the case, the Father would most likely still hold the baby for a few days before finally letting go." Eventually, the father baboon made his move. "Holding the baby, in all sorts of contorted positions, he tried numerous times to climb down the tree. He tested the lionesses' interest with each descent. Finally, the combination of daring courage and the lionesses own desire to take cover in some shade allowed him to find safety and a little peace in a neighboring tree," they wrote. "I like to think that the little guy survived with the help of his troop. He was alive and safe in his father's arms when we left and that's how I like to remember it. No matter what, he remains an inspiration – and a reminder, that life is fragile," they said. We were fortunate to see numerous lions and leopards on our 16-day trip to Botswana, but the reality is that lion prides are vanishing across the continent. Panthera estimates that nearly a century ago there were approximately 200,000 lions living across 54 countries in Africa. Today, lions are extinct in 26 of those countries and there are fewer than 30,000 left in the wild. We have heard that number may even be closer to 20,000 or 25,000. Lions have vanished from over 80% of their historic range due to illegal hunting, loss of habitat and habitat fragmentation. Only 7 countries: Botswana, Ethiopia, Kenya, South Africa, Tanzania, Zambia and Zimbabwe are believed to each contain more than 1,000 lions. And while leopards are the most versatile of the Big Cats, Panthera estimates that even they have vanished from almost 40% of their historic range in Africa, and from over 50% of their historic range in Asia. There's no time to wait, we need to make a difference today to ensure the Big Cats are here for generations to come. Evan Schiller is a professional wildlife and golf course photographer and his wife, Lisa Holzwarth, is a writer and marketing professional (the LEO Chronicles). They have made a number of trips to Africa in the last five years and are passionate about saving the world's Big Cats. Their efforts include raising awareness and funds to save the Big Cats from extinction, a very real threat. The couple has organized fundraising events benefitting National Geographic's Big Cats Initiative and Panthera, the largest dedicated funder of wild cat conservation globally.